The 15-day Chinese New Year festival ringing in the Year of the Horse begins January 31st. But you don't have to wait until then to celebrate! 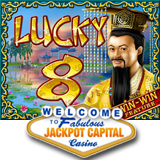 Jackpot Capital Casino has just launched a new Asian-themed slot game, Lucky 8, that's perfect for the occassion! Lucky 8 is a 25 payline Asian-themed slot game with exotic images of the Orient spinning on its five reels. It features the Win-Win feature that ensures everyone’s a winner in the bonus round. Jackpot Capital’s $225,000 Casino Race, inspired by the popular reality show The Amazing Race, continues to award $30,000 in casino bonus prizes every week until February 17th. Full contest details and current Scoreboard standings are available at http://promotions.jackpotcapital.eu/2014casinorace.